our perfectly imperfect life: Munch. Munch. Munch. I think I've mentioned before that Nika likes loves to eat. In fact, she quite possibly eats more than Mason does. I love my little eater, but the girl is eating me out of house and home. If you walk toward the kitchen, she goes nuts. She loves yogurt and fruit ... she will holler at you if she sees it and you have not given it to her yet. So funny ... little stinker! 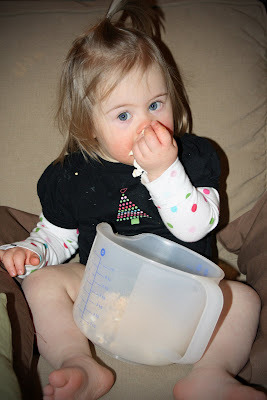 A couple weeks ago Mason was eating popcorn and it didn't take Nika long to take over the bowl. 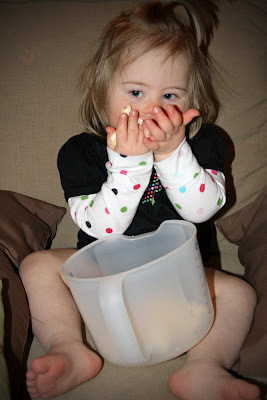 You go girl...that's the way popcorn should be eaten! I think she has made herself at home! I bet you're loving it! What a change for you to have an enthusiastic eater, huh? I have to admit--she looks a lot like me when I eat popcorn!! how sweet is that. She is so cute! I bet she didnt get all those kinds of foods in the baby home. They probably only had certain things, so now she's really enjoying those taste buds ?huh? Go, Nika!!!! She is way too adorable. How can you stand it??!! So cute. happy to hear she loves to eat!